In mid to late 1800s, the vast Utah Territory still encompassed Utah, parts of Wyoming, Colorado and much of Nevada. And civil war was imminent. The U.S. government, fearing Western secession and alliance with the South, wanted to counter political unrest and bias with ongoing, up-to-date national news. Distant relatives wanted to hear more often from home. The Pony Express was a mail delivery service which operated from April 3, 1860 to October 24, 1861 from St. Joseph, MO to Sacramento, CA and became the most direct and quickest way to communicate from east-west before the transcontinental telegraph. The Overland Stage continued to use the trail until the transcontinental railway was finished on May 10, 1869. It became a vital communication link between California and the Union just before the Civil War. The Pony Express consisted of 184 stations (see list) often located in existing buildings. Some were located in military forts, while others were built from scratch. The entire route was divided up into five divisions: St. Joseph – Fort Kearney; Fort Kearney – Horseshoe Creek; Horseshoe Creek – Salt Lake City; Salt Lake City – Robert’s Creek; and Roberts Creek – Sacramento. In order to maintain a rigid schedule, 157 relay stations were located from 5 – 20 miles apart as the terrain would permit. At each stationriders would exchange their tired horses for fresh ones, while Home Stations provided room and board for the riders between runs. This practice allowed the mail to be whisked across the continent in record time. The Pony Express delivered mail, carried by horseback riders who relayed to stations across the Great Plains, the Rocky Mountains, and the high sierras of the western United States. During its brief existence, it greatly reduced the time it took for messages to cross the country with telegraph communications covering about half the distance from the east coast to Missouri. By having a short route and using only mounted riders rather than traditional stagecoaches, this established a fast mail service with letters delivered in 10 days, a duration many said was impossible. It was not exactly overnight and perhaps overpriced for the time, at $5 a ½ ounce. While I am the employ of A. Majors, I agree not use profane language, not to get drunk, not to gamble, not to treat animals cruelly and not to do anything else that is incompatible with the conduct of a gentleman. And I agree, if I violate any of the above conditions, to accept my discharge without any pay for my services. The Pony Express confirmed that a transcontinental delivery system could be built and operated continuously year round. Since its replacement by the telegraph from coast to coast, the Pony Express has become part of the lore of the American west. On Oct. 24, 1861, the country’s coast-to-coast telegraph system was up and running. Two days later, the Pony Express business was shuttered for good. Its dependence on the capability and endurance of each rider and horses over technological innovation was part of the American rugged individualism of the frontier times. During its life, 120 riders rode 308 relays carrying 34,000 pieces of mail across 650,000 miles. Twice as fast as previous methods. and still, it never made a profit! 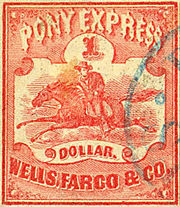 Wells Fargo, provided safe mail and freight services, used the Pony Express logo from 1866 to 1890. The US Postal Service used “Pony Express” as a trademark for its postal services. Initially there were 157 stations about 10 miles apart which was roughly the distance a horse could travel at a gallop before tuckering out. Each station provided the rider with a fresh horse, taking only the mail pouch with him. California mustangs were often used for the Western trail, Kentucky and Utah Territory, and thoroughbreds for the Eastern route. Many horses exhibited an uncanny sense of direction and were known to carry a rider through disorienting sand storms and raging snow blizzards. The mail pouch (mochila) was very important, in fact so important that it was said the horse and rider could perish before the pouch did. It was thrown over the saddle with the rider sitting on it. Each corner of the pouch had a pocket, in which bundles of mail were padlocked for safety. 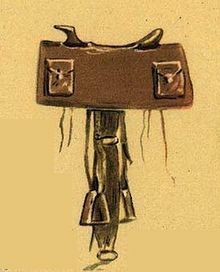 The pouch held about 20 lbs of mail and along with 20 lbs of personal gear (a water sack, a Bible, a horn – for alerting the station master that a new horse was required, a revolver, and a rifle or another revolver) along with the rider, the horse was fully loaded. Eventually, only a revolver and the water sack remained, reducing the weight to 165 lbs on the horses back (yup, the riders had to weigh no more than 125 lbs!). The riders changed every 75-100 miles and rode day and night – in emergencies, a rider might ride two stages 150-200 miles) back-to-back, over 20 hours on a galloping horse! These riders got $25/week as pay in comparison to an unskilled labourer $1/week. Each horse was about 14 ½ hands high and 900 lbs, hence the term pony, even if it wasn’t technically correct. During the short time that the Pony Express operated, only once did the mail not go through. After completing eight weekly trips from both Sacramento and Saint Joseph, it was forced to suspend mail services because of the outbreak of the Paiute Indian War in May 1860. Probably more than any other rider in the Pony Express, William Cody (a.k.a. Buffalo Bill) epitomizes the legend and the folk lore of the Pony Express. From Certified Contract with Overland Mail Company, March 12, 1861; Senate Executive Document 21, 46th Congress, 3rd Session, pp. 7-8. Route 10773. From St. Joseph by Troy, Lewis, Kinnekuk, Goteschall, Log Chain, Seneca, Gautard’s, Marysville, Cottonwood, Rock House, Rock Creek (Lodi P.O. ), Virginia City, Big Sandy, Millersville, Kiowa Station, Liberty Farm, 32 Mile Creek, Sand Hill, Kearney Station, Fort Kearney, Platt’s Station, Garden, Plum Creek, Willow Island, Midway, Gilman’s, Cottonwood Springs, Cold Springs, Fremont Springs, Dansey’s Station, Gills, Diamond Spring, Frontz Station, Julesburg, Nine Mile Station, Pole Creek No. 2, Pole Creek No. 3, Mud Springs, Court-House, Chimney Rock Station, Scott’s Bluff, Horse Creek, Cold Springs, Verdling’s Ranch, Fort Laramie, 9-mile House Station, Horse Shoe, Elk Horn, La Bonta, Bed Tick, Lapierelle, Box Elder, Deer Creek, Bridger, North Platte, Red Butte, Willow Springs, Horse Creek, Sweet Water, Plants, Split Rock, Three Crossings, Ice Springs, Warm Springs, Rocky Ridge, Rock Creek, Upper Sweet Water, Pacific Springs, Dry Sandy, Little Sandy, Big Sandy, Big Timber, Green River, Ham’s Fork, Millersville, Fort Bridger, Muddy, Quaking Aspen, Bear River, Needle Rock, Head of Echo Canon, Half Way, Weber, Wheaton Springs, East Canon, Mountain Dale, Salt Lake, Traders’ Rest, Rockwell, Dug Out, Camp Floyd, Bush Valley, Point Lookout, Simpson’s Springs, Dugway, Fish Springs, Willow Springs, Deep Creek, Antelope Springs, Shell Creek, Egan Canon, Bates’, Mountain Springs, Ruby Valley, Jacob’s Wells, Diamond Springs, Sulphur Springs, Robert’s Creek, Camp Station, Dry Creek, Simpson’s Park, Reese, Dry Wells, Smith’s Creek, Edwards’ Creek, Cold Springs, Middle Gate, Sand Springs, Sand Hill, Carson Sink, Desert Station, Fort Churchill, Clugage’s, Nevada, Carson City, Genoa, Friday’s, Yank’s, Strawberry, Webster’s, Moss, Sportsman’s Hall, Placerville, Duroc, and Folsom (by rail) to Sacramento, ______ miles and back, six times a week, supplying Denver City and Great Salt Lake City 3 times a week each way, and run pony express semi-weekly in 10 days 8 months, and 12 days 4 mouths of the year—to convey for government 5 lbs. matter free of charge. Various names are associated with each station at times, most just local features or people’s names who worked or lived there. Other station names have been mentioned here as they are mentioned on various maps, however little information has been found but the names are still retained here for further research. I have included various coords/positions of these stations in my GPX file below. Anyone going to any station on a route marked with PET markings, please forward the tracks and accurate way points to me, so I can correct the information. Thank you! Sources: Patrick Hearty, NPEA Utah, 2005; writings/notes of Sir Richard Burton; members of this forum; Mason, The Pony Express in Nevada, 1976; and numerous sources on the internet (wikimedia.org, geocaching.com, nps.gov, xphomestation.com, wyomingplaces.org). Thank you to all! A quite comprehensive Ph. D. (1994) write up (limited photos and maps) can be found here. The following is a GPX file of all the stations that I have found info for or people have contributed, as well as monuments/markers/kiosks and other things to see while in the area. Some locations have coords for the station (if it is there still, ruins, etc.) and a monument or information kiosk. Others have more than one way point (some are designated (?)). The Green track is the actual PET as described on various digital/topo maps, etc. that I have or have found. The Red track is an inferred route joining the green tracks together or continuing the route to the end. Parts of this route have been confirmed by the Magenta track made by a forum member. Thank you to all for your contributions and help! Please help make this file and this featured trails article more accurate/correct by emailing me any more accurate coordinates, corrected info, omissions, etc. as per my profile on this forum (CanuckMariner). Very detailed map from NPS. Please visit Expedition Utah and search for more trip reports on various sections of the Pony Express Trail by our members.